Coherus BioSciences, Inc., reported topline results from an ongoing Phase 3 clinical study of CHS-1420, an adalimumab (Humira) biosimilar candidate. The study met its primary endpoint demonstrating similarity between CHS-1420 and Humira with respect to percentage of subjects achieving 75% improvement in psoriasis area and severity index (PASI-75) at Week 12. The 95% confidence intervals for the difference between treatment groups fell well within the prespecified margin. Both CHS-1420 and Humira were similarly well tolerated with similar safety profiles in this study. This was a confirmatory, randomized, double-blind, active-control, parallel-group, 3-part study in patients with active, moderate to severe, chronic plaque psoriasis. In treatment period 2, half the subjects randomized to Humira will cross-over to CHS-1420, modeling a chronic patient’s transition to a biosimilar. Comparative safety, including immunogenicity, and durability of response to CHS-1420 and Humira at week 16 and 24 are key secondary endpoints. These data will be presented at an upcoming scientific conference. The full dataset through treatment period 2 will be available in Q4 2016 and included in the BLA submission to follow. As part of a cost-savings restructure, Epirus is selling the assets from its $14m acquisition of Bioceros last September to its biosimilars partner Polpharma. Last year , Epirus Biopharmaceuticals paid $14m (€12.5m) for Netherlands-based Bioceros Holding BV, adding three biosimilar candidates and a proprietary Chinese hamster ovary (CHO) platform (CHO) for the manufacture of monoclonal antibodies. But nine months later, the firm has announced in an SEC filing it is selling the Dutch subsidiary, including the “CHOBC cell line platform, all related intellectual property rights, a fully equipped laboratory and bioreactor capabilities” to its biosimilar development partner Polpharma for $3.5m. The beneficiary of the sale, Polpharma, has been working with Epirus since July 2015 when the two firms struck a development and commercialisation agreement for a number of biosimilar products. 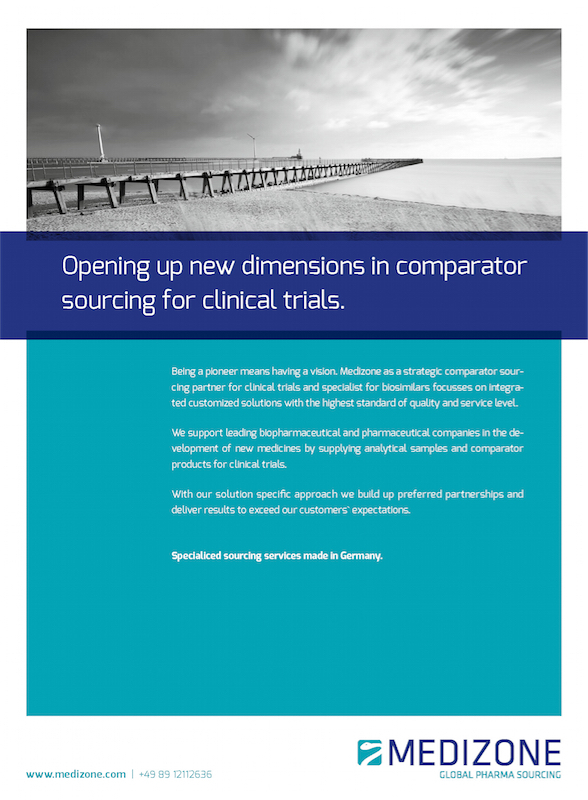 Medizone campaign: Opening up new dimensions in comparator sourcing for clinical trials. Being a pioneer means having a vision. Medizone as a strategic comparator sourcing partner for clinical trials and specialist for biosimilars focusses on integrated customized solutions with the highest standard of quality and service level. The U.S. Food and Drug Administration approved Inflectra (infliximab-dyyb) for multiple indications. Inflectra is administered by intravenous infusion. This is the second biosimilar approved by the FDA. adult patients with chronic severe plaque psoriasis. The FDA’s approval of Inflectra is based on review of evidence that included structural and functional characterization, animal study data, human pharmacokinetic and pharmacodynamics data, clinical immunogenicity data and other clinical safety and effectiveness data that demonstrates Inflectra is biosimilar to Remicade. Inflectra has been approved as biosimilar, not as an interchangeable product. Inflectra is manufactured by Celltrion, Inc, based in Yeonsu-gu, Incheon, Republic of Korea, for Hospira. Sandoz, announced that EMA has accepted their Marketing Authorization Application for its biosimilar to Amgen’s EU-licensed Neulasta (pegfilgrastim) – a long-acting recombinant human granulocyte colony-stimulating factor (G-CSF). Sandoz is seeking approval for the same indication as the reference product. Pegfilgrastim is a prescription medicine used in cancer patients (except those with chronic myeloid leukemia and myelodysplastic syndromes) to help with some of the side effects of their treatment. It reduces the duration of neutropenia and the incidence of febrile neutropenia that are a result of their chemotherapy treatment. The incidence of febrile neutropenia occurring with common chemotherapy regimens is 25 to 40% of treatment-naive patients. “Sandoz is the leading provider of daily G-CSF in Europe and the regulatory filing of our biosimilar pegfilgrastim further cements our commitment to patients undergoing cancer treatment” said Mark McCamish, M.D., Ph.D., and Head of Global Biopharmaceutical & Oncology Injectables Development at Sandoz. “If approved, physicians in the EU will have another high-quality Sandoz biosimilar treatment option for patients needing granulocyte colony-stimulating factors” McCamish continued. Sandoz believes that the totality of evidence in its submission, including three pivotal clinical trials – one pharmacokinetic and pharmacodynamic study in healthy volunteers and two comparative efficacy and safety studies in breast cancer patients – is expected to satisfy the regulatory requirements for demonstrating high similarity to the reference product and therefore justifies use of biosimilar pegfilgrastim in the reference product’s indication. The trastuzumab biosimilar, to be marketed under the trade name HERtiCAD, is the first trastuzumab biosimilar to receive authorization from the Russian regulatory body. The market authorization of the trastuzumab biosimilar (fully developed and produced by BIOCAD) followed the results of a randomized multicenter clinical study comparing the pharmacokinetics, immunogenicity, safety, and efficacy of BCD-022 (trastuzumab biosimilar) to the innovator Herceptin (F. Hoffmann-La Roche Ltd). Dmitry Morozov, founder and CEO of Biocad, said, “In 2014, world sales of the original drug trastuzumab were over $6.8 billion. Russia’s government spent over 5 billion rubles (130 mln USD) for original medicine and there are still uncovered medical need of Russian patients in trastuzumab. The approval of trastuzumab biosimilar is definitely good news for patients who previously had limited access to advanced therapeutics, and in particular for those hindered by the extra high cost of antibody biopharmaceuticals. Biocad’s trastuzumab biosimilar is produced in a new, ultra-modern Neudorf facility set in a special economic development district outside St. Petersburg. The company has already registered two other biosimilars of rituximab and bevacizumab. Rituximab was the first mAb biosimilar approved in Russia under the trade name Acellbia and by now used in more than 6 000 patients with non-Hodgkin’s lymphoma and chronic lymphoid leukemia under federal reimbursement. The joint venture between Biogen and Samsung BioLogics, Samsung Bioepis, has been granted European Commission (EC) approval for Benepali, an etanercept biosimilar referencing Enbrel. Benepali® has been granted marketing authorization in the European Union (EU) for the treatment of adults with moderate to severe rheumatoid arthritis (RA), psoriatic arthritis, non-radiographic axial spondyloarthritis and plaque psoriasis. Biogen intends to make Benepali available for patients in the coming weeks. Benepali is the first etanercept biosimilar referencing Enbrel to be approved in the EU, making it the first subcutaneous anti-TNF biosimilar available there. Anti-TNF’s are the largest component of the EU biologics market, accounting for approximately $10 billion of all biologics sold there. The EC approval was based on a robust preclinical and clinical data package submitted to the European Medicines Agency by Samsung Bioepis. The data in the preclinical submission leveraged sophisticated molecular analytics, technical development and manufacturing expertise. Confirmatory data from well-controlled, head-to-head Phase 1 and Phase 3 clinical trials compared Benepalito its reference product Enbrel. The 52-week, double-blind, Phase 3 study randomized 596 patients with moderate to severe RA despite methotrexate therapy, across more than 70 sites in 10 countries to receive Benepali or Enbrel in a 1:1 ratio. Analysis of the primary endpoint showed that Benepali had equivalent efficacy to Enbrel, as shown by an ACR20 response at week 24 of 78.1% in the Benepali arm versus 80.3% in the Enbrel arm. Further analysis at 52 weeks confirmed comparable efficacy as shown by an ACR20 response of 80.8% in the Benepali arm versus 81.5% in the Enbrel arm. The safety profile of Benepali was comparable to that of Enbrel throughout the study. Amgen announced the submission of a Biologics License Application (BLA) with the United States FDA for ABP 501, a biosimilar candidate to Humira (adalimumab). Amgen believes this submission is the first adalimumab biosimilar application submitted to the FDA and represents Amgen’s first BLA submission using the 351(k) biosimilar pathway. ABP 501 is a biosimilar candidate to adalimumab, an anti-TNF-alfa monoclonal antibody, which is approved in many countries for the treatment of various inflammatory diseases. Amgen’s BLA submission includes analytical, clinical and pharmacokinetic data. Phase 3 comparative efficacy and safety studies were conducted in both moderate-to-severe plaque psoriasis and moderate-to-severe rheumatoid arthritis. The Phase 3 studies met their primary endpoints showing clinical equivalence to adalimumab. Safety and immunogenicity of ABP 501 were also comparable to adalimumab. Data to support the transition of adalimumab patients to ABP 501 are included in the submission. Samsung Bioepis Co., Ltd. announced that the European Medicines Agency’s (EMA) Committee for Medicinal Products for Human Use (CHMP) has adopted a positive opinion on Benepali – a biosimilar version of Enbrel® (etanercept). The drug, previously known as SB4 – for the treatment of rheumatoid arthritis, psoriatic arthritis, axial spondyloarthritis (ankylosing spondylitis and non-radiographic axial spondyloarthritis) and plaque psoriasis. This marks the first time the CHMP has adopted a positive opinion on an etanercept biosimilar. The CHMP’s positive opinion will now be referred to the European Commission (EC) which will review and decide on the grant of a marketing authorization for Benepali®. If a marketing authorization is granted, Benepali will be the first etanercept biosimilar to be approved in the European Union (EU). This positive CHMP opinion on Benepali was based on Phase 1 and Phase 3 clinical studies that tested the biosimilarity of Benepali to Enbrel. In the 52-week Phase 3 clinical study, which involved 596 patients randomized across 70 sites in 10 countries, Benepali demonstrated comparable safety and equivalent efficacy to Enbrel, as evidenced in ACR20 response rate of 80.8% in the Benepali arm versus 81.5% in the Enbrel arm. Cinfa Biotech S.L., the biosimilars company of Infarco group, today announced that the first subjects have been dosed in a clinical trial of B12019, a biosimilar version of Neulasta(R) (pegfilgrastim) to treat chemotherapy-induced neutropenia. B12019 is a pegylated granulocyte colony-stimulating factor (G-CSF) receptor agonist, which is used to stimulate bone marrow to produce more neutrophils to decrease the incidence of infections in patients undergoing chemotherapy. B12019, the lead development program of Cinfa Biotech, has completed preclinical studies, and the manufacturing process (GMP) for B12019 has been implemented at commercial scale. This trial is the first part of a clinical development program investigating the clinical comparability of B12019, which has been designed based on the longstanding expertise of Cinfa Biotech’s team in developing biosimilars. The single dose, cross-over study will enrol up to 170 healthy volunteers in Germany. It primarily investigates the pharmacokinetics (PK) and the pharmacodynamics (PD) of B12019 as compared to Neulasta(R). The study design is based on scientific advice from the European Medicines Agency (EMA) and is tailored to the specific properties of pegfilgrastim.